Pre-eclampsia is a hypertensive disorder of pregnancy that is associated with elevated maternal risk for cardiovascular disease. Electrocardiographic (ECG) changes in pre-eclampsia have been documented in some studies. Electrocardiography has recently emerged as a useful tool to evaluate cardiovascular complication during and after pregnancy. The present study was therefore undertaken to find out electrocardiographic changes in pre-eclamptic women, visiting Regional Institute of Medical Sciences, Manipur. The aim of this study was to determine the electrocardiographic changes in both pre-eclampsia and age matched normotensive pregnant women. In this study, 25 pregnant women (gestational age >20 weeks) with pre-eclampsia in the range of 18 to 45 years of age were recruited and compared with the equal number of age matched normotensive pregnant women. ECG parameters of pre-eclamptic women were compared with those of normotensive pregnant women. The data were then analyzed using SPSS software. 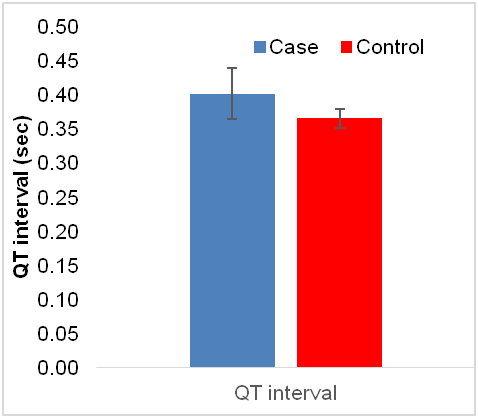 Pre-eclamptic women showed significantly longer QRS (0.10±0.02 sec vs 0.09±0.05 sec), prolonged QT (0.401±0.03 sec vs 0.365±0.003sec) and QTc (457.73±37 msec vs 416.47± 25.4 msec) than control group. The study shows that electrocardiography can be used to evaluate cardiovascular risk in pre-eclamptic women. Konar H. DC Dutta’s Textbook of Obstetrics. 7th ed. New Delhi: Jaypee Brothers Medical Publishers; 2013. Sogani S, Varma V, Sarkar PD. Estimation of thyroid hormones levels in preeclamptic pregnant women: an early predictor of the disease. Al Ameen J Med Sci. 2015; 8(4):266-70.